TextExpander is a productivity multiplier, a knowledge base from which you can communicate quickly and accurately across your devices. TextExpander eliminates the need to type things over and over. Using a quick search or abbreviation, instantly insert snippets of text from a personal or shared repository of boilerplate, emails and other content. For example, type “em1” and it expands to your email address of “email@companyemail.com”. TextExpander comes with a variety of ready-made snippets to get you started, available from Public Groups. These snippet groups include autocorrect libraries in English, French, and German to correct your typing in all apps, as well as groups for Accented Words (crème brûlée), HTML and CSS (<h1></h1>), Symbols (©), Emoji and more. Create flexible templates for emails and forms, using “Mad Libs” style fill-in-the-blank areas. As you expand email template snippets, customize the field for the recipient’s first name, and any other data unique to the situation. This is both faster and more accurate than typing it out by hand, or coping/paste from a previously written message. Insert the current or future date, paste copied text as a snippet expands, choose the final cursor location, and run scripts. TextExpander for Mac, TextExpander for Windows, and TextExpander for iPhone & iPad keep your snippets current on all your devices using TextExpander.com, the easy way to share snippets. Control sharing and editing permissions from TextExpander.com. A single TextExpander account includes all the apps and updates. 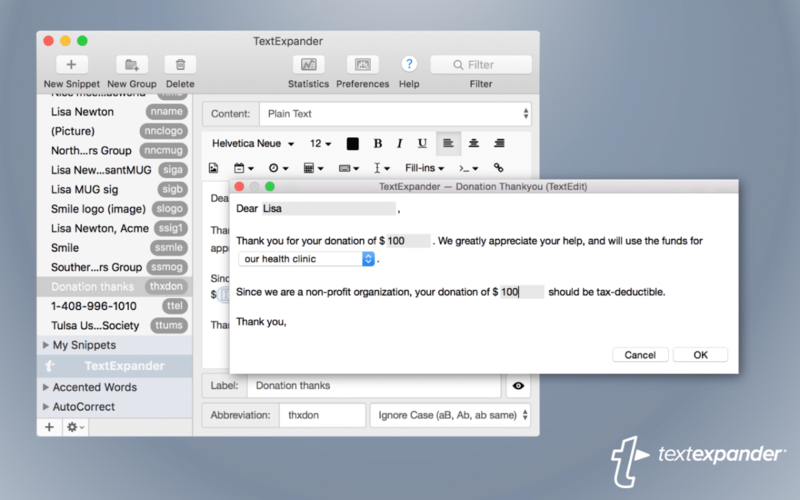 TextExpander boosts team productivity by cutting the repetitive typing that creeps into every task. A quick shortcode while typing drops in the necessary language to send to clients and customers. In the words of your best writer, gather the knowledge of your most experienced staff in a quick-access knowledge base of reusable emails, prose, and messaging. TextExpander keeps your whole team communicating consistently and accurately. Management tools let team leaders adjust permissions, including those for editing snippets. Team usage statistics highlight aggregate productivity gains and the most popular snippets. Built with collaboration in mind, the team’s collection of snippets becomes a de facto knowledge base for an organization. TextExpander offers multiple search options to quickly find and expand shared snippets. New team members onboard quickly when given access to the institutional memory and to accurate information in a uniform voice. TextExpander for Chrome v1 is now available in public beta. Get it from the Chrome Web Store: https://smle.us/techrome. TextExpander for Mac 6.5 and TextExpander for Windows 2.0 introduce a new snippet editor. It takes the complexity out of using macros by replacing macro notation with simple visual blocks, decluttering the editor for easier viewing and editing. Macros allow users to expand dates and times, customize otherwise static chunks of text with fill-in-the-blank areas and more. “The ability to share snippets with collaborators is priceless­ in an organization with people around the world using snippets 50+ times a day, we’re now easily able to manage, update, and standardize THOUSANDS of snippets. “TextExpander is absolutely essential for my job. When I first discovered TextExpander, and saw what it could do, I thought, ‘This could change my life’. Life Hacker plan for individuals start at US $3.33 / month. Team plans start at US $7.96 / user / month. Smile develops productivity software for Mac, Windows, Chrome, iPhone, and iPad. Headquartered in San Francisco, California, Smile is a closely knit, geographically diverse company, with roots in the Mac community. We have proudly served our customers for over a decade. We create. We solve. We ship.